Every Wednesday on 7News at 5, WTRF showcases a different high school band from the Ohio Valley on the C.A. House High School Band of the Week feature. 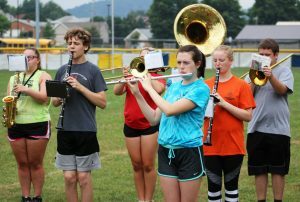 To kick off the 2018 high school football season, WTRF chose to highlight the John Marshall High School Marching Monarchs, under the direction of Tracey Filben.